Ulysses S. Grant (born Hiram Ulysses Grant; April 27, 1822 – July 23, 1885) was the 18th president of the United States (1869–1877) following his success as military commander in the American Civil War. Under Grant, the Union Army defeated the Confederate military, secession and the war, which ended with the surrender of Robert E. Lee's army at Appomattox Court House. As president, Grant led the Radical Republicans in their effort to eliminate vestiges of Confederate nationalism and slavery, protect African American citizenship, and pursued Reconstruction in the former Confederate states. In foreign policy, Grant sought to increase American trade and influence, while remaining at peace with the world. Although his Republican Party split in 1872 as reformers denounced him, Grant was easily reelected. During his second term the country's economy was devastated by the Panic of 1873, while investigations exposed corruption scandals in the administration. While still below average, his reputation among scholars has significantly improved in recent years because of greater appreciation for his commitment to civil rights, moral courage in his prosecution of the Ku Klux Klan, and enforcement of voting rights. There are abundant historical material resources on Grant and his role during the Civil War and thereafter. However, there have been few historical scholarly studies, mostly negative, on his presidency. Analysis of Grant's presidency by some modern scholars, including Grant biographers Jean Edward Smith (2001) and H.W. Brands (2012), have generally been more positive and less critical of Grant. Encyclopedic presidential summary biographies of Grant rely heavily on secondary sources and tend to offer non scholarly negative views of Grant. 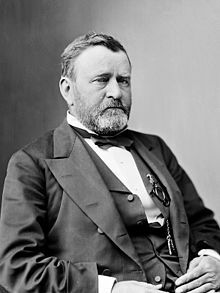 According to one bibliographical source, to obtain a more complete assessment of Grant and his presidency during Reconstruction both contemporary, primary, and scholarly accounts of Grant, his Inaugural Addresses, including his communications and annual messages to Congress are recommended readings. In May 2012, on the fiftieth anniversary of the founding of the Ulysses S. Grant Foundation, Mississippi State University was selected as the permanent location for Ulysses S. Grant's Presidential Library. Historian John Y. Simon edited Grant's letters into a 32-volume scholarly edition published by Southern Illinois University Press. Badeau, Adam (1887). Grant in Peace: From Appomattox to Mount McGregor. New York: D.Appleton. Brands, H. W. (2012). "Presidents in Crisis Grant: Takes on the Klan". American History: 42–47. Brisbin, General James S. (1868). The campaign lives of Ulysses S. Grant, and Schyler Colfax. C. F. Vent & Company, Cincinnati. Broadwater, Robert P. (2012). Ulysses S. Grant: A Biography. ABC-CLIO. ISBN 978-0-3133-9255-9. Brown, E. E. (1885). Life of Ulysses Simpson Grant. D. Lothrop & Company. Burr, Frank A.; Newman, John Philip (1885). A new, original and authentic record of the life and deeds of General U. S. Grant. Empyreal publishing house. Bunting III, Josiah (2004). Ulysses S. Grant. New York: Times Books. ISBN 0-8050-6949-6. Cadwallader, Sylvanus (1955). Three years with Grant, as recalled by war correspondent Sylvanus Cadwallader. Knopf Publishers, New York. ISBN 978-0-8032-6369-7. Chernow, Ron (2017). Grant. Penguin Books. ISBN 978-0-5255-2195-2. Coolidge, Louis (1917). Ulysses S. Grant. Houghton Mifflin Co., Boston, New York. Conger, Arthur Latham (1931). The Rise of U.S. Grant. Century Company. Corning, Amos Elwood (1918). Hamilton Fish. The Lanmere publishing co.
Cox, Jacob Dolson (July 1, 1895). "How Judge Hoar Ceased to be Attorney General". Atlantic Monthly Making of America. Cornell University Library. 76 (454): 162–173. Crafts, William August (1868). LIFE OF Ulysses S. Grant: HIS BOYHOOD, CAMPAIGNS, AND SERVICES,MILITARY AND CIVIL. Samuel Walker and Company. Cross, Nelson (1872). The Modern Ulysses, LL. D.: His Political Record. J. S. Redfield. Dowdall, Denise M (2013). From Cincinnati to the Colorado Ranger: The Horsemanship of Ulysses S. Grant. BookBaby. ISBN 978-0-9574-0213-3. Dunning, William (1905). Reconstruction Political and Economic 1865–1877. 22. Edmonds, Franklin Spencer (1915). Ulysses S. Grant. George W. Jacobs, Publishers, Philadelphia. Charles, Ellington (1987). The Trial of U.S. Grant: The Pacific Coast Years, 1852-1854. A.H. Clark Company. ISBN 978-0-8706-2169-7. Fairman, Charles (1971). Reconstruction and Reunion, 1864-88. Macmillan. —— (2011). Grant's Final Victory: Ulysses S. Grant's Heroic Last Year. Da Capo Press. ISBN 978-0-3068-2056-4. Foner, Eric (2002) . Reconstruction, America's unfinished revolution, 1863-1877. Harper Collins (original publisher: Harper & Row). ISBN 978-0-0609-3716-4. Frantz, Edward O. (2014). A Companion to the Reconstruction Presidents 1865-1881. Chichester, West Sussex, United Kingdom: John Wiley & Sons, Inc. ISBN 978-1-4443-3928-4. Grant, Julia Dent; Simon, John Y. (1988). The Personal Memoirs of Julia Dent Grant (Mrs. Ulysses S. Grant). SIU Press. ISBN 978-0-8093-1443-0. Garland, Hamlin (1898). Ulysses S. Grant: His Life and Character. New York: Doubleday & McClure Co.
Hardy, William E. (2008). "South of the Border: Ulysses S. Grant and the French Intervention". Civil War History. 54 (1): 63+. doi:10.1353/cwh.2008.0008. Headley, Joel Tyler (1872). The Life of Ulysses S. Grant. K. B. Treat Publishing, New York. —— (1879). The Life and Travels of General Grant. Hubbard Bros, Philadelphia. Howland, Edward (1868). Grant as a soldier and statesman [electronic resource] : being a succinct history of his military and civil career. Hartford, J.B. Burr & Company. Kelsey, Marie Ellen (2005). Ulysses S. Grant: A Bibliography. ABC-CLIO. ISBN 978-0-3130-8327-3. King, Charles (1914). The True Ulysses S. Grant. J. B. Lippincott Company, Philadelphia, London. Kreiser, Christine (2013). "Royal Visit". American History. 47 (6): 19. Larke, Julian K. (1868). The life, Campaigns and Battles of General Ulysses S. Grant, comprising a full and authentic account of the famous soldier, from his earliest boyhood to the present time. New York, Ledyard Bill; Chicago, Charles Bill. —— (1879). General U. S. Grant: His Early Life and Military Career, with a brief account of his presidential administration and tour around the world. W. J. Johnston, New York, 528 pages. Longacre, Edward G. (2006). General Ulysses S. Grant The Soldier And The Man. Cambridge, Massachusetts: First De Capo Press. ISBN 0-306-81269-X. Mansfield, Edward Deering (1868). A Popular and Authentic Life of Ulysses S. Grant. R.W. Carroll & Co.
—— (1868). A popular and authentic life of Ulysses S. Grant. R.W. Carroll & Co.
Mantell, Martin E. (1973). Johnson, Grant, and the Politics of Reconstruction. New York: Columbia University Press. Martinez, James Michael (2007). Carpetbaggers, Cavalry, and the Ku Klux Klan: Exposing the Invisible Empire During Reconstruction. Rowman & Littlefield. ISBN 978-0-7425-5078-0. Marshall, Edward Chauncey (1869). The ancestry of General Grant, and their contemporaries. Sheldon & Company, New York. McFeely, William S. (1974). Woodward, C. Vann (ed.). Responses of the Presidents to Charges of Misconduct. New York, New York: Delacorte Press. ISBN 0-440-05923-2. Nevins, Allan (1957) . Hamilton Fish: The Inner History of the Grant Administration, Volume I. New York: Dodd, Mead. —— (1957) . Hamilton Fish: The Inner History of the Grant Administration, Volume II. New York: Dodd, Mead. Patrick, Rembert W. (1968). The Reconstruction of the Nation. New York: Oxford University Press. Perret, Geoffrey (1997). Ulysses S. Grant Soldier & President. Random House NY. —— (2004). Grant and Twain. New York: Random House. Remlap, L.T. (1879). General U. S. Grant's tour around the world : embracing his speeches, receptions, and description of his travels : with a biographical sketch of his life. James Betts publishers. Renehan, A; Lowry, J C (1995). "The oral tumours of two American presidents: what if they were alive today?". J R Soc Med. 88 (7). PMC 1295266. PMID 7562805. Rhodes, James Ford (1920). History of the United States from the Compromise of 1850 to the McKinley-Bryan Campaign of 1896. 6 & 7. Ross, Ishbel (2016). The General’s Wife: The Life of Mrs. Ulysses S. Grant. Pickle Partners Publishing. Sarna, Jonathan (2012). When General Grant Expelled the Jews. New York: Nextbook Press. ISBN 978-0-8052-4279-9. Scaturro, Frank J. (1998). President Grant Reconsidered. Lanham, Maryland: University Press of America. Simpson, Brooks D. (1991). Let Us Have Peace: Ulysses S. Grant and the Politics of War and Reconstruction, 1861–1868. Chapel Hill, North Carolina: University of North Carolina Press. Simpson, Brooks D. The Reconstruction Presidents. Lawrence, Kansas: University Press of Kansas. Simpson, Brooks D. (2000). Ulysses S. Grant: Triumph Over Adversity, 1822–1865. Boston, Massachusetts: Houghton Mifflin. ISBN 0-395-65994-9. Simon, John Y. (2002). "Ulysses S. Grant". In Graff, Henry (ed.). The Presidents: A Reference History (7th ed.). Stoddard, William Osborn (1886). Ulysses S. Grant. White, Stokes, & Allen, New York. Tatum, Lawrie (1970) . Our red brothers and the peace policy of President Ulysses S. Grant. Lincoln, University of Nebraska Press. Thayer, William M. (1885). From Tannery to the White House: The Life of Ulysses S. Grant : His Boyhood, Youth, Manhood, Public and Private Life and Services. James H. Earle, Boston. Thomas M., Pitkin (2010). The Captain Departs: Ulysses S. Grant's Last Campaign. Southern Illinois University Press. ISBN 978-0-8093-8611-6. Unger, Irwin (2015) . Greenback Era. Princeton University Press. ISBN 978-1-4008-7766-9. Waltmann, Henry G. (1971). "Circumstantial Reformer: President Grant & the Indian Problem". Arizona and the West. 13 (4): 323–342. JSTOR 40168089. Wister, Owen (1900). Ulysses S. Grant. George H. Ellis, Boston. Woodward, C. Vann (April 1957). "The Lowest Ebb". American Heritage. 8 (3): 53–108. Archived from the original on January 6, 2009. Retrieved March 27, 2014. Badeau, Adam (1881). Military History of Ulysses S. Grant, from April 1861, to April 1865. New York: D. Appleton. Ballard, Michael B. (2013). Grant at Vicksburg: The General and the Siege. Southern Illinois University Press. Bearss, Edwin C. (1991). The Vicksburg Campaign. Dayton, Ohio: Morningside. ISBN 0-89029-308-2. Catton, Bruce (1954). U.S. Grant and the American Military Tradition. Boston: Little, Brown. —— (1956). This Hallowed Ground: A History of the Civil War. New York, New York: Vintage Books. ISBN 978-0-307-94708-6. —— (1960). Grant Moves South. Boston: Little, Brown. ISBN 0-316-13207-1. Crummer, Wilbur F. (1915). With Grant at Fort Donelson, Shiloh and Vicksburg. E. C. Crummer & Co.
Commager, Henry Steele, ed. (1950). The Blue and the Gray: The Story of the Civil War as Told by Participants. Coppée, Henry (1866). Grant and his campaigns : a military biography. New York : C. B. Richardson; Cincinnati, C. F. Vent. Davis, Burke (2016). To Appomattox: Nine April Days, 1865. Open Road Media. ISBN 978-1-5040-3442-5. Davis, William C. (2014). Crucible of Command. Da Capo Press. ISBN 978-0-306-82245-2. Deming, Henry Champion (1868). The life of Ulysses S. Grant, general United States Army. S.S. Scranton & Co., 562 pages. Donovan, James (2008). A Terrible Glory Custer and the Little Bighorn --- The Last Great Battle of the American West. New York: Back Ray Books. ISBN 978-0-316-06747-8. Flood, Charles Bracelen (2005). Grant and Sherman The Friendship That Won The Civil War. New York, New York: Harper Perennial. ISBN 0-06-114871-7. Foote, Shelby (1958). The Civil War: A Narrative, Fort Sumter to Perryville, Vol.1. Random House. —— (1963). The Civil War: A Narrative, Fredericksburg to Meridian, Vol.2. Random House. —— (1974). The Civil War: A Narrative, Red River to Appomattox, Vol.3. Random House. Fuller, Maj. Gen. J. F. C. (1957). Grant and Lee, a Study in Personality and Generalship. Bloomington, Indiana: Indiana University Press. ISBN 0-253-13400-5. —— (1991). The Generalship of Ulysses S. Grant. Da Capo Press. p. 446. ISBN 978-0-3068-0450-2. Groom, Winston (2009). Vicksburg, 1863. Alfred A. Knopf, N.Y. ISBN 978-0-3072-7677-3. ——. Shiloh 1862. National Geographic Books. ISBN 978-1-4262-0879-9. Hurst, Jack (2008). Men of Fire: Grant, Forrest, and the Campaign That Decided the Civil War. Basic Books. ISBN 978-0-4650-0847-6. —— (2012). Born to Battle. Basic Books. ISBN 978-0-4650-2018-8. Korda, Michael (2004). Ulysses S. Grant: The Unlikely Hero. New York: Atlas Books/HarperCollins. Korn, Bertram W. (1951). American Jewry and the Civil War. New York: Jewish Publication Society of America. McWhiney, Grady (1995). Battle in the Wilderness: Grant Meets Lee. Fort Worth, Texas: Ryan Place Publishers. Lowry, Don (1995). Towards an Indefinite Shore: The Final Months of the Civil War, December 1864-May 1865. Hippocrene Books. ISBN 978-0-7818-0422-6. McDonough, James Lee (1977). Shiloh: In Hell Before Night. Knoxville, Tennessee: University of Tennessee Press. McDonough, James Lee (1984). Chattanooga: A Death Grip on the Confederacy. Knoxville, Tennessee: University of Tennessee Press. McPherson; Robertson; Sears; Symonds; Waugh (2011). Hearts Touched by Fire. The Modern Library, New York. ISBN 978-0-6796-0430-3. Maney, R. Wayne (1994). Marching to Cold Harbor. Victory and Failure, 1864. Shippensburg, Pennsylvania: White Mane Pub. Co.
Matter, William D. (1988). If It Takes All Summer: The Battle of Spotsylvania. Chapel Hill, North Carolina: University of North Carolina Press. Miers, Earl Schenck (1955). The Web of Victory: Grant at Vicksburg. New York: Knopf. Nevins, Allan. The War for the Union (4 vol 1959-71), comprehensive coverage of all aspects of the war. Rhea, Gordon C. (1994). The Battle of the Wilderness May 5–6, 1864. Louisiana State University Press. ISBN 0-8071-1873-7. —— (1997). The Battles for Spotsylvania Court House and the Road to Yellow Tavern May 7–12, 1864. Louisiana State University Press. ISBN 0-8071-2136-3. —— (2000). To the North Anna River: Grant and Lee, May 13–25, 1864. Louisiana State University Press. ISBN 0-8071-2535-0. —— (2002). Cold Harbor: Grant and Lee, May 26 – June 3, 1864. Louisiana State University Press. ISBN 0-8071-2803-1. Pratt, Fletcher (1956). Civil War on Western Waters. Holt. Schenker, Carl R. (June 2010). "Ulysses in His Tent: Halleck, Grant, Sherman, and 'The Turning Point of the War'". Civil War History. 56 (2). Simpson, Brooks D. (2009). After Shiloh: Grant, Sherman, and Survival. Carbondale, Illinois: Southern Illinois University Press. Smith, Gene O. (1989). Lee and Grant: A Dual Biography. Promontory Press. ISBN 978-0-8839-4073-0. Smith, Timothy B. (2013). Rethinking Shiloh: Myth and Memory. Univ. of Tennessee Press. ISBN 978-1-5723-3988-0. Stansfield, F.W.H. (1864). The life of Gen'l U.S. Grant, the General in Chief of the United States Army. New York : T.R. Dawley. Steere, Edward (1960). The Wilderness Campaign. Harrisburg, Pennsylvania: Stackpole Co.
Varney, Frank P. (2013). General Grant and the Rewriting of History. California: Savas Beatie. ISBN 978-1-61121-118-4. Williams, T. Harry (1962). McClellan, Sherman and Grant. New Brunswick, New Jersey: Rutgers University Press. Wilson, James Grant (1868). The life and campaigns of Ulysses Simpson Grant, general-in-chief of the United States army. New York, R.M. De Witt. —— (1916). The life of John A. Rawlins, lawyer, assistant adjutant-general, chief of staff, major general of volunteers, and secretary of war. The Neale Publishing Company. Woodworth, Steven E. (2005). Nothing but Victory: The Army of the Tennessee, 1861 – 1865. New York: Alfred A. Knopf. ISBN 0-375-41218-2. Badeau, Adam (1887). Grant in peace. From Appomattox to Mount McGregor. Hartford, S. S. Scranton & co.
Grant, Ulysses (1912). Cramer, Jesse Grant (ed.). Letters of Ulysses S. Grant to his Father and his Youngest Sister, 1857-78. G. P. Putnam's Sons, Knickerbocker Press, New York, London. John Y., Simon (1967–2009). "The Papers of Ulysses S. Grant". Mississippi State University Online Edition. —— (1991). The Papers of Ulysses S. Grant: October 1, 1867-June 30, 1868. SIU Press. ISBN 978-0-8093-1693-9. Grant, Ulysses S. (1865). llustrated life, campaigns and public services of Lieut. General Grant : the hero of Fort Donelson! Vicksburg! ... : with a full history of his life, campaigns, and battles ... Philadelphia : T.B. Peterson & Brothers. Dana, Charles Anderson (1909). Recollections of the Civil War. D. Appleton and Company. Remlap, L. T. (1885). The life of General U.S. Grant, his early life, military achievements, and history of his civil administration, his sickness and death, together with his tour around the world. Chicago, Fairbanks & Palmer Pub. Co.
Young, John Russell (1879). Around the world with General Grant. v.1. The American news co.
—— (1879). Around the world with General Grant. v.2. The American news co.
Bonekemper III, Edward H. (2004). A Victor, Not a Butcher: Ulysses S. Grant's Overlooked Military Genius. Washington, DC: Regnery. ISBN 0-89526-062-X. Bonekemper III, Edward H. (April 2011). "The butcher's bill: Ulysses S. Grant is often referred to as a 'butcher,' but does Robert E. Lee actually deserve that title?". Civil War Times. 52 (1): 36–43. Foner, Eric (November 2, 2012). ""The Man Who Saved the Union: Ulysses Grant in War and Peace" by H. W. Brands (book review)". The Washington Post. Hackett, Frank Warren (1911). "Chapter III: The Alabama Claims – The Treaty of Washington". Reminiscences of the Geneva Tribunal of Arbitration, 1872, the Alabama Claims. New York City: Houghton Mifflin. pp. 45–50. OCLC 2621753. Grant, Ulysses S. (1990). McFeely, Mary Drake; McFeely, William S. (eds.). Memoirs and Selected Letters. The Library of America. ISBN 978-0-940450-58-5. McPherson, Edward (1880) [First published 1871]. "Chapter LIII: XVth Amendment, Votes on Ratification, Proclamation of Ratification, Bills Enforcing and Votes Thereon". The Political History of the United States of America During the Period of Reconstruction. Washington, D.C.: Chapman. p. 545. ISBN 1-4255-6744-4. OCLC 492311406. Murray, Robert K.; Blessing, Tim H. (2004). Greatness in White House. Pennsylvania State University Press. Porter, Horace (1897). Campaigning with Grant. Alexandria, Virginia: Time-Life Books. Russell, Henry M. W. (Spring 1990). "The memoirs of Ulysses S. Grant: The rhetoric of judgment". Virginia Quarterly Review. 66 (2): 189–209. Simon, John Y (1982). "Grant: A Biography by William S. McFeely (book review)". The Wisconsin Magazine of History. 65 (3): 220–221. JSTOR 4635640. Simpson, Brooks D. (2000). "Continuous Hammering and Mere Attrition: Lost Cause Critics and the Military Reputation of Ulysses S. Grant". In Gallagher, Gary W.; Nolan, Alan T. (eds.). The Myth of the Lost Cause and Civil War History. Bloomington, Indiana: Indiana University Press. ISBN 0-253-33822-0. Skidmore,, Max J. (February 2005). "The Presidency of Ulysses S. Grant: A Reconsideration". White House Studies. 5 (2): 255–270. Weigley, Russell F. (October 2001). "Grant by Jean Edward Smith (book review)". The Journal of Military History. 65 (4): 1104–1105. JSTOR 2677657. Wilentz, Sean (March 14, 2010). "Who's Buried in the History Books?". The New York Times. Young, John Russell (July – October 1880). "Around the World with General Grant". Quarterly Review. New York City: Leonard Scott Publishing Company. 150 (126): 126. ^ Brands 2012b, p. 44. ^ Brands 2012b, p. 44; Murray & Blessing, p. 55. ^ a b c d e Simpson 2005, p. Introduction and Acknowledgements xxv.